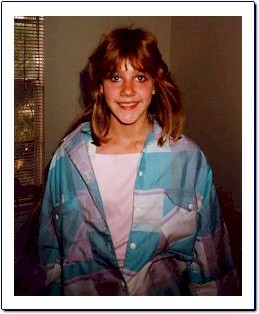 On the evening of January 29, 1988, in Albuquerque, New Mexico, Spring Miller and her sister, April, went for a walk. As they approached an entryway to the Apartments at 7300 Montgomery Blvd. NE, the girls noticed a blue and white truck waiting to leave the parking lot. They stopped and waited for the truck to pass. The driver of the vehicle grinned and motioned with his hand for them to go on. When Spring and April were in front of the vehicle the man accelerated and hit the girls. He hit Spring first and ran over her head. April was next and he ran over her legs. April recovered from her physical injuries. Spring died. Church of Christ at 7201 Montgomery Blvd. NE were at the scene. There was also an elderly lady who was driving a white vehicle which was directly behind the suspect's vehicle. Despite the many witnesses, no one ever came forward. The suspect was driving a blue and white 4 x 4 Bronco or Blazer type vehicle. He is described as having long hair. 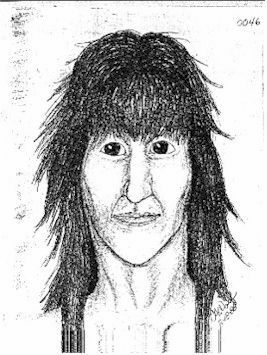 Below is a sketch of the suspect based on the description given by one of the eyewitnesses. This suspect would be older now and may have changed his appearance. If you or anyone you know has information about this murder, we urge you to help. You may contact the APD Cold Case Squad, Officer Rich Lewis at the office at 505-924-6095, call Crimestoppers at 505-843-7867, or email us. Any information about this murder, as insignificant as it seems, may be important!